Robert G. | Geo Brothers Fence Co. Robert G. – Geo Brothers Fence Co.
Posted on March 5, 2015 March 6, 2015 by Robert G.
With Ice dams, wind storms, blizzards, frost heaves, and compounded snow over 100 inches wreaking havoc on us, what a winter Boston has had! Spring will come inevitably. When it does show up, the light will shed the many problems homeowners have in store. Areas of concern will be roofing, gutters, down spouts, asphalt, lawns, basement flooding and especially fences. Snow has been shoveled, piled and plowed on any and every fence by Bob your Neighbor and Mother Nature herself. It has not only been snow, but record low temperatures which cause frost heaves that push and pull posts and undermine the fence’s level and stability. And I would bet your gates out of whack just like your back – from all that shoveling. Posted on December 3, 2014 December 3, 2014 by Robert G.
The lifespan of a fence depends on you. A typical cedar wood fence is built to last 20-25 years, but there are things homeowners can do to extend the life of your fence. For many of our customers, we know that keeping children and pets safe is the main objective. But many times, full-fence replacement is not a viable option. Finances may be an obstacle at the moment. Or maybe you’re selling your home soon and your fence isn’t in major disrepair, but could still use a little work. Each customer’s situation is different. Here are three options for repairing and prolonging your wood fence. If the vertical fence post is broken or askew, level the post by pushing it straight into the ground. Then, measure two feet perpendicular from the fencepost and bang a stake into the ground. Nail the opposite end to the post, forming a 45-degree angle. Repeat this on the opposite side of the fence so that the falling down post is bolstered on both sides. The post is now completely braced and should hold up through any storm. This is a temporary fix, but can be made permanent at another time by simply replacing the broken post, which can be done as long as the fence rails are in good shape. Prolong your fence’s life – keep it looking new nearly 20 years later! Fill the pump sprayer with the oil repellant spray. Then spray and brush the sealer onto your fence posts and rails. Pay particular attention to the rails and dowel ends. This helps reduce the risk of rotted rails. This is a great tip for prolonging the life of your wood fence, and will keep it looking new even up to 18 years after installation. 4) Repeat numbers 1-3 periodically to keep your fence straight and strong and in working order for years to come. These tips are meant to be easy enough for any of our customers to complete, but we understand other life demands may take precedent. As always, we would be happy to provide you a free estimate on any fence repair or maintenance services. Just call us at 781-599-6531 to schedule an appointment! Posted on September 15, 2014 October 22, 2014 by Robert G.
Oh, your dog’s an escape artist? I got a call from a frantic woman who was at her wit’s end. No matter what she did her Husky/Shepherd mix continued to get out of her yard and wreak havoc throughout the neighborhood. I went to her house and told her, “No problem.” I was an expert! I assessed the situation and saw she had a mismatch of different types of fences at different heights. I met the dog, which was athletic and highly energetic. I told her we needed to install a 6-foot fence and we would make sure there were absolutely no spaces at all for escape! The job cost about $5,000. I told her I will make sure the dog can’t get out. She hired us and we started work immediately. When we finished we called the homeowner out to look at the impenetrable wall we had built, all of us wearing a smug grin of pride. “Well, let him out! Let’s see if he likes it,” I said. The dog bounded out like a bull in a china shop. His fur was puffed up, electrified with excitement. He started frantically running up and down the fence, his paws tearing up the ground, realizing he could not get out; his old escape hatches were gone! His frantic pace back and forth continued. Then, like a shooting star, he sprinted right, shot back to the left, leapt on top of a brick, backyard fireplace and sprung over the fence. Gone! I guess the dog really likes his freedom! Lesson learned. 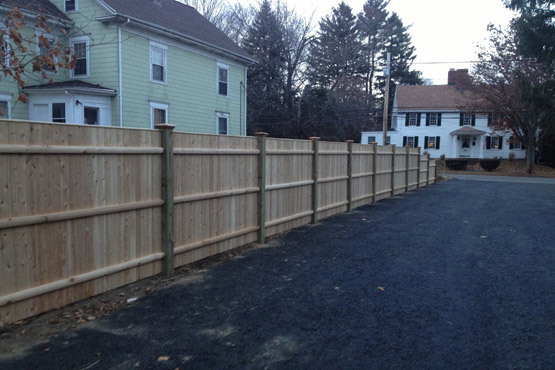 Here at Geo Brothers Fence, we work with our customers to provide customized fencing that’s right for you. If you have a similar situation, with animals getting out (or in!) give us a call today at 781-599-6531, and we’d be happy to provide you a free estimate. Fence Options for Pet Owners—Which Fence Is Right for You? Posted on July 1, 2014 July 17, 2014 by Robert G.
Whether you are replacing an old fence or installing one for the first time, there are many variables to consider when choosing which kind of fence to put up, how high it should be, and what materials it should be made out of. Putting up a fence to keep your pet in is an especially delicate process, as it requires special consideration of your pet, his abilities, and your yard. If you have a large dog, or a dog that is especially good at climbing, you probably want to stay away from chain link fences. Not only do they provide the perfect foot holds for an athletic dog, they are also generally shorter than other types of fences. Some large dogs may be able to jump over a four-foot chain link fence without any problem. However, if your dog is small or is not prone to climbing, chain link might be the perfect option for you. Wooden slat fences are especially good for large or aggressive dogs, as they are not easy to climb and they shield the dog from the outside world. Often, dogs can become agitated if they see people walking past the house, simply because it is in their nature to defend their territory. A wooden fence, however, is usually over six feet high and is constructed to be solid, which makes it difficult for any dog to either see through it or climb it. Wrought iron fences are bound to be the most expensive, and unless you have a particularly docile dog, do not provide much enclosure or protection. Most dogs will be able to climb them, and some may even be able to slip between the bars and escape. The final fence option is a bit more progressive, and comes in the form an invisible fence. Instead of building a physical fence, an electronic perimeter is built around the house, so that when the dog strays too close to the perimeter, he is either shocked (in the same manner as a bark collar), or hears an uncomfortable, high-pitched noise. For more information about different kinds of fences and which is the right choice for your dog, contact us at GEO Brothers Fence today! Posted on June 15, 2014 July 17, 2014 by Robert G.
I can tell you we are a great company, that we provide quality work to our customers, and that we stand behind our work 100 percent. But who would believe us? Nothing speaks louder than a stamp of approval from customers like you. Proof that we are who we say we are. And that’s what matters most – to us, and to other potential customers. As a consumer, I put more trust in the good things I hear about a company through word-of-mouth, than I do in what any owner or salesperson is attempting to sell me on. That’s why we rely on and are grateful to customers like you for your willingness to take the time to rate us on sites like Yelp!, Angie’s List and the Better Business Bureau. We believe in being transparent. By doing so, we believe we build better trust with our customers, and ensure we are constantly striving to be our best. Who can prove to you that we will do what we say we will? Our past customers. Enclosed…..The two fellows who worked on that project did a great job and were able to incorporate a small change in the design, which really made the trellis a custom piece of construction. I am sure that they found this project quite a challenge because they had to shove their way into the backyard and then make their way through the raspberry patch near the rear of the house. But that did not deter them in the least! We love the new trellis and its unique design and I wanted to pass along this information to you so you know what great workers you have making your custom products. Please give them our compliments!! P.S. We will certainly recommend your company to our friends based upon the quality of your work and your personalized customer service approach. Thanks again. To read more reviews about our company from other satisfied customers, or to leave one yourself, please see our testimonials page, or visit our pages on Yelp!, Angie’s List and the Better Business Bureau.